CCM’s videos, workbooks and study guides have been used for teaching healthcare professionals at all stages of their careers: from students to postgraduate courses. Medical education and training programs led by CCM’s experienced faculty offer in-depth exploration of the challenges of delivering bad news; guiding difficult conversations about choices and uncertain outcomes; and developing partnerships for making what are often hard decisions. Our materials emphasize the patient’s perspective and recognize that the language used by medical professionals can result in misunderstandings about prognosis and the risks and benefits of treatment options. CCM’s tools are designed to facilitate communication and strengthen relationships between patients and the healthcare team. CCM’s new Difficult Conversations Workbook, with its accompanying video, offers the unscripted stories of five patients facing and managing life-limiting illness and highlights their exploration of needs, preferences and goals. The content provides a framework for healthcare professionals to better understand the issues and concerns that patients identify when cure is no longer viable and treatment options are limited. The stories shed light on their expectations of physicians for clear and honest communication. The patients talk about their responsibility in understanding their prognosis, treatment options and quality of life concerns. “For every patient, the best medical care is that which is tailored to one’s personal values, understanding, and goals. But for most people the task of identifying, ‘what is most important to me?’ ‘what do I need to understand to make this decision?’ and ‘how do I choose among the options?’ is not easy. This program will help each person organize their own thoughts and feelings so as to better answer those and other questions that arise, and to thereby participate more fully as an empowered patient in their medical care and treatment. “It was my privilege to be a part of the care team for Noel Fritzinger (patient in the film), who recently died from metastatic prostate cancer. I know it was one of his wishes to support this initiative as much as possible and he gave me his consent to continue to be able to identify him by name…. 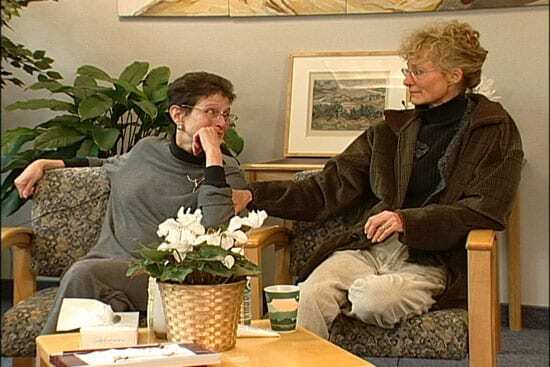 During my tenure as his oncologist we had many conversations about the end of life. He was an active participant at the very beginning of this Initiative and shared it with me. I was and continue to be very impressed with the goals and materials of this program. It is a key need in our community and many others to help physicians and nurses initiate these difficult but universal conversations. I find the materials and language very helpful and reassuring for patients and their families. The Toolkit is especially helpful in identifying a patients goals and allowing us to talk about them freely in order to create and develop a specific plan of care. Living with an incurable disease is a process that has many phases and people’s goals change regularly as they move from phase to phase. This program acknowledges that and aids people and their families as they transition. I expect it to be a useful tool at every phase, from diagnosis to treatment to end of life. It is my pleasure to support the Difficult Conversations Initiative to the best of my ability. The Difficult Conversations Workbook is available in interactive form here at SpeakSooner.org, as well as for hard copy purchase on our Products page. To find out more about CCM’s Difficult Conversations education and training programs please contact us. Over the course of the video, the viewer hears firsthand from these four patients about their experiences of illness and treatment. They speak freely about such topics as their expectations of doctors, the impact of their diagnosis on relationships and sense of self, their attitudes toward spiritual issues, their fears about death and dying, and their hopes for treatment and beyond. Particular attention is directed towards the impact of healthcare professionals’ words and manner and the complexities of communication in the doctor-patient relationship. Advanced Cancer video is available for purchase on our Products page. To find out more about CCM’s Advanced Cancer education and training programs please contact us.